After the outbreak of the First World War, Bean was appointed as official correspondent for Australia in the war, and he was one of three press correspondents to go with the First AIF (Australian Imperial Force) to Gallipoli. At the first opportunity Bean went ashore, observing the fighting and the daily experiences of the troops at close quarters. 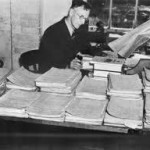 He kept copious diaries through his war service, as well as reporting on the conflict. His book Letters from France, with dispatches from the war on the Western Front, was published in 1917. His diaries and notebooks formed the basis for his twelve-volume Official History of Australia in the War of 1914-1918. As is clear from looking at Bean’s writings from before the war, he had a strong interest in and affection for rural Australia. This would translate into his writings about the war, and is suggested by the type of Australian English terms that appear in the Official History, and in Bean’s wartime publications such as Letters from France. The long journeys in droving bullocks down the great stock routes across the ‘back country’ offer many conditions similar to those of a military expedition. Official History (1921), Vol. 1, p. 47. Bean uses a range of Australian English terms more intimately associated with the First World War experience in his Official History, although he uses only a few war slang terms (perhaps unsurprisingly given the relatively formal nature of the publication). They include terms such as: Anzac, Aussie, digger, ‘Australian soldier’, possie, short for position and meaning ‘a place of shelter or firing position’, and shirker, used in the wartime context for someone who failed to enlist. 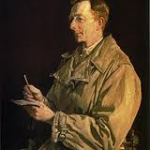 Bean’s Letters from France includes terms such as neutral, ‘a recruit not yet on active service’, six bob a day tourist, ‘an Australian soldier’ (reflecting his rate of pay), and Hay, hell and Booligal, an expression indicating that a certain location is a place of the greatest imaginable discomfort. Bean’s use of Australian English in his writings about the war can thus be seen to have contributed to the recorded evidence of Australian English, but also helped enhance the link between the Australian bush experience and the First World War. This helped Bean shape his Anzac mythology – an understanding of the war and the Australian soldier that has had a powerful impact on our cultural understanding of the Australian experience of war. A brief biographical sketch of Bean can be found in the Australian Dictionary of Biography here. For excerpts from Bean’s Gallipoli diaries, see Kevin Fewster (ed. ), Bean’s Gallipoli: the Diaries of Australia’s War Correspondent. For online editions of Bean’s Official Histories, see here. This entry was posted in patriotism, rural Australia, war, writers and tagged Anzac, Anzac legend, Anzac mythology, Aussie, back country, bush scouting, bush worker, bushman, C.E.W. Bean, digger, Gallipoli, Hay hell and Booligal, neutral, possie, shirker, six bob a day tourist, squatting by Amanda Laugesen. Bookmark the permalink. Hay, hell and Booligal is surely an echo of Hell, Hull, and Halifax, the three places in England (er, well, two of them are, anyway) that beggars prayed to be delivered from: Hull because of its notorious jail, and Halifax because of its summary capital punishment (on the Halifax gibbet, a variety of guillotine) for thieves caught in the act.